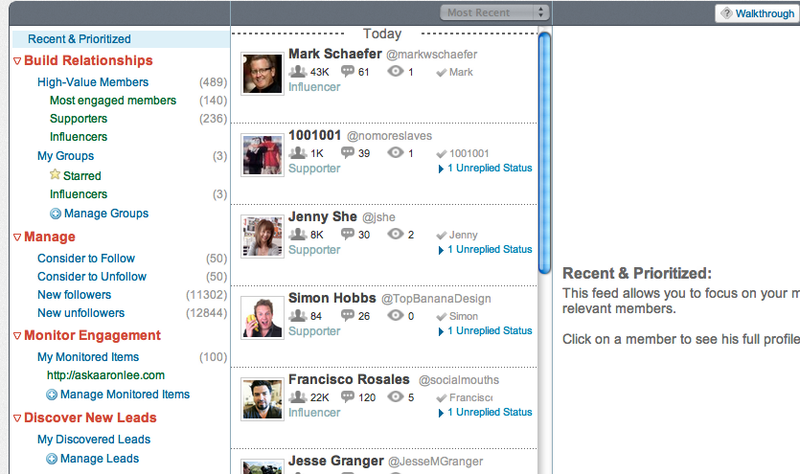 Commun.it is probably one of the best relationship-management tools out there. It helps you to cultivate your followers on Twitter and make important connections to build your business. Cultivate your relationships on Twitter based on groups. The tool is also very user-friendly. You can grow and manage your community fully from its dashboard. This feature made me realize that I wasn’t following back many people who had previously engaged and shared my content. I think it’s a shame if you don’t get to know the people who took the time to know you. Another tool that your business can use to quickly latch onto conversations is inboxQ. Because every question is an opportunity, it is important that you listen to questions that people are asking on Twitter. Because lots of chatter and tweets are happening every second, questions can go unanswered and opportunities may go to waste. The bad news is even Twitter does not have a proper function to track down these questions. 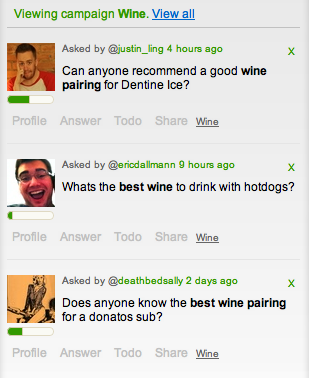 The good news is you can use inboxQ to find questions people are asking on Twitter. All you need to do is set up a campaign by inserting keywords for the questions people are most likely to ask in your industry. 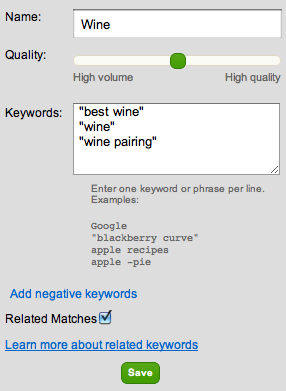 Set keywords related to your industry. Questions Twitter users are asking. Then inboxQ will do its magic and pull questions from Twitter containing those keywords. By helping people, you’re able to establish yourself as an expert in your industry and gain new followers. Your engagement with them could also help in getting them to follow you back after you have followed them. Answering questions may seem like a simple tactic, but simple gestures are sometimes the most effective. Tweriod and Buffer are a match made in heaven. Tweriod is quite straightforward—it analyzes your tweets and your followers’ tweets to give you the best time and day of the week to tweet to get the highest visibility for your content. The analysis generally shows you the time and day that your followers are most active on Twitter, which helps you share your content more effectively. Analysis of the best time to tweet. After finding out the best time to tweet, most people will stop there and not do anything else with the report. But with Buffer, you can simply log into your Buffer account and it will automatically set the time that Tweriod suggests for your tweets. 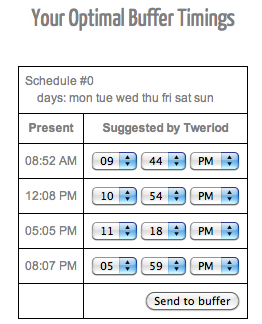 Set optimal timing on Twitter as suggested by Tweriod. By analyzing and finding out the best time to tweet with Tweriod and setting the time with Buffer, you’ll be sure that your future tweets are fully optimized and will reach more people. ClickToTweet is a tool that I’ve been experimenting with recently after I noticed that top blogs such as KISSMetrics and HubSpot are using it. 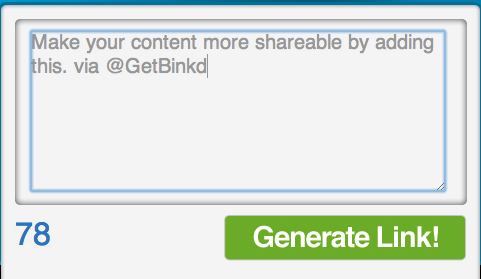 This simple tool allows you to customize preloaded tweets that you want your readers to share. You can use this tool to increase your business website’s visibility as it makes content more shareable. When a user clicks the link, your preloaded message will automatically be added to their Twitter status box. They then can click to tweet and your message will be out there. This is different from a normal Retweet button on your blog because it is more visible than simply retweeting your blog title. ClickToTweet is a great example of how Twitter continuously evolves to maximize the 140 characters and includes the most content at the most visible level. Use ClickToTweet to make tweets more sharable. Go to the ClickToTweet website. Write the message you want and add your Twitter handle. Fill in the description you want and add your Twitter handle. 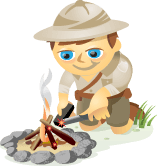 Copy the link from your blog and use a URL shortener like bit.ly or goo.gl to shorten it. Paste the short URL link into ClickToTweet. Get the permalink URL from your blog and shorten it with a URL shortener. Now that you have your URL, the next step is to simply add it to your blog. You’re done! Next is to experiment with it using your own blog’s content. I recently stumbled upon Brandfluencers. This tool is quite straightforward and simple to use too. 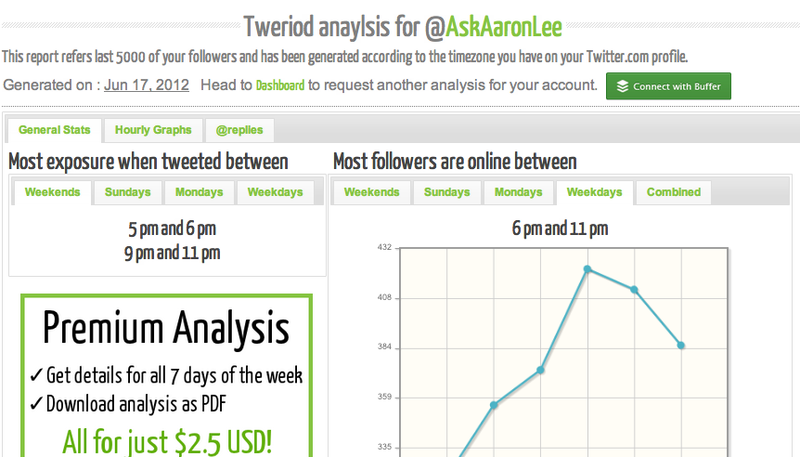 It will identify users who have referred the most visits and page views to your blog via Twitter. All you need to do is simply log into your Google Analytics account and it will generate the report. 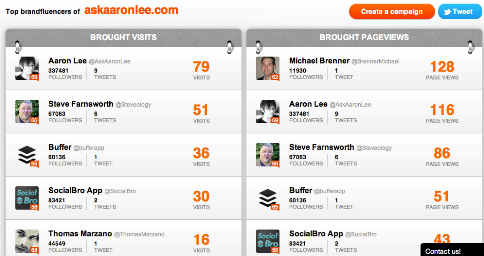 Brandfluencers displays Twitter users who have referred the most traffic and page views. By knowing who drives the most traffic and page views to your site, you can focus on continuing to build relationships with them or show your appreciation and thank them for sharing your content. As this tool is relatively new, I believe that it is not as accurate as it could be. I tested it using another account and the traffic results showed a slight discrepancy. But I believe that it gives you a general idea, which is better than having no idea at all. What do you think about these tools? Have you tried any of them before? Do you happen to use any other lesser-known tools out there that you would like to recommend? Please share them in the comments box below.